After 40 years of absence, Skyhawk returns to the RIAT in 2017. 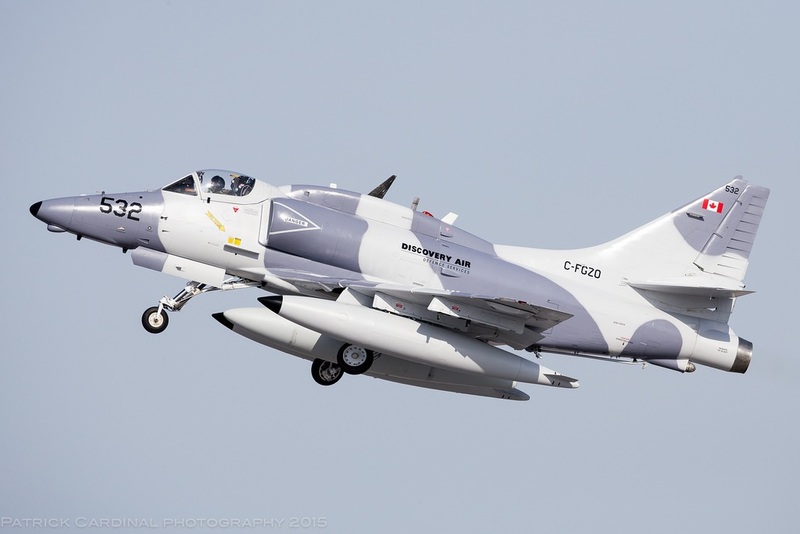 Making a rare visit from Germany to this year's Air Tattoo will be an A-4N Skyhawk from a fleet operated by Discovery Air Defence, based at Wittmund. The A-4N Skyhawk will be on static display on the Saturday and Sunday of the 2017 show. The Canadian company began operating a fleet of seven Skyhawks from the German base in January 2015 after winning a contract to provide an adversarial air support to help train Luftwaffe crews. The A-4s are contracted to provide services ranging from threat simulation, target towing to flight test support. The aircraft based at Wittmund were originally Israeli Air Force airframes before being purchased, stripped and modified by Discovery Air Services. This modification including fitting modern navigation equipment and glass cockpits, whilst retaining some of the key military capabilities like the A-4's air-to-air refuelling systems. In February 2017 it was reported that Discovery had joined forces with Inzpire Limited to bid for the UK Ministry of Defence's Air Support to Defence Operational Training (ASDOT) programme. The last time an A-4 visited the Air Tattoo was 1977, when a small number of A-4Gs visited Greenham Common from 805 Squadron, Royal Australian Navy. The aircraft launched from HMAS Melbourne, which itself was attending the Silver Jubilee Fleet Review in Portsmouth. An Air Tattoo spokesman said: "Confirmation that an A-4 Skyhawk is participating in next month's Air Tattoo is great news and will be welcomed, in particular, by all our enthusiasts. The type last appeared at an Air Tattoo 40 years ago when the event was staged at RAF Greenham Common and since then we've been trying hard to get one back. It's a compact little fighter that in its heyday punched above its weight and played important roles in significant conflicts during the 60s, 70s and 80s. Its rarity alone makes it one of the stand-out aircraft taking part in this summer's airshow."